Our Managing Director, Shaunvir Mahil, will be speaking at one of the world’s biggest social media conferences, the Social Media Week (SMW) in London from 14-18 September 2015 as one of the keynote speakers, giving two talks at the event. He will be speaking on the main stage on the ‘Next Generation of Cloud Services’, where he will highlight how the Cloud is the future of work, and how the Cloud is essential for working smarter in the tech-based 21st century. Shaunvir Mahil will also be a part of an expert panel discussion on the ‘Future of Work’. The second talk, an hour-long masterclass, will focus on ‘How to Outsource’ and is aimed at SMEs who want to outsource successfully like the MNCs but don’t quite know how. Their trial and error methods usually end in bad experiences and the VE MD’s talk aims to guide such SMEs through the correct process of outsourcing. the world’s largest and most high-profile brands. More than 70,000 senior marketers, entrepreneurs, influences, and founders from leading digital media and companies, 5,000 speakers and more than 1 million people connecting through social and mobile participate in it, making it world’s biggest source of information. SMW hosts conferences across 17 cities on six continents, including Europe, North America, South America, Africa, Australia and Asia. The cities include New York, Copenhagen, Miami, Los Angeles, Rotterdam, Chicago, Bangalore, Mumbai, Hamburg and now London in September. 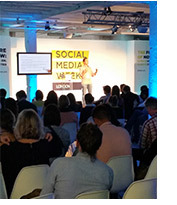 Our MD had attended the Social Media Week in London last year and again in New York earlier this year because he found the content very useful and informative. And this year’s SMW is all the more special since the VE MD Shaunvir Mahil will be among the key influencers. Independence Day 2015 was celebrated at all the VE offices in India with patriotism, gaiety, fun and games. Employees arrived traditionally attired in the colors of the Indian Tricolor and enthusiastically decorated their workstations and bays with colorful streamers all in green, red and white. The HR management had organized an afternoon of games and quizzes on India’s history and celebrated national figures, and there was much enjoyment and laughter as one and all enthusiastically participated in the events. The memorable afternoon was rounded off by distributing sumptuous snacks and beverages to the employees after which it was work as usual. University graduate now joins the select club of Indians who are already heading multinational giants the world over, such as Satya Nadella of Microsoft. Another proof of India’s sound education system that turns out over 4 million graduates each year, many of who go on to excel and thrive in the United States, particularly Silicon Valley. VirtualEmployee.com gives you free and direct access to this massive talent pool without you having to fly them over!